Are you looking for Motorhome Security ? An alarm system that will suit your motorhome. We know that modern motorhomes are expensive to buy, so we have security systems that will protect your purchase. Most modern motorhomes are based on an existing manufactures chassis, common ones are. Most modern motorhomes use Can Bus technology, what this means to the customer is that there will usually be an existing remote/fob that locks and unlocks the doors. We now have Alarms that will interface with the vehicles Can Bus, this means that the alarm will be controlled by your existing remote control, we recommend and install Autowatch 695 Canbus Alarm. Or the Autowatch 475RLi both of these are Cat 1 Insurance approved alarms. All motor home alarms are installed to Cat1 Insurance standards, if your Motor home has an existing Immobiliser built in and most of them do, then we would install a Cat 2 to 1 upgrade. You would get movement sensors in the cab, this gives protection from entry by smashing the door glass. you would have protection from your existing door switches. we can also supply wireless detectors for your outside lockers if required. wireless sensors mean that you do not have wires showing anywhere, and we do not have to disturb your cabinets and trim. and you will have a secure way of overriding the alarm. One of the most frequently asked questions is can we set the alarm while we are sleeping? Answer : yes you can set the alarm and isolate the Interior sensors. We are also approved Smart Track dealers, we can supply and install tracking systems made specifically for motor homes. So in the event that your motor home does get stolen then you and the police can Track the vehicle. 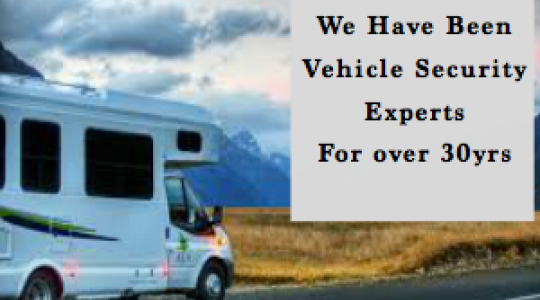 What ever your motor home is or your security requirement we can help. We are based in Aylesford near Maidstone in Kent, you can bring your motor home to us, or we can come to you and install your motor home alarm on site, we cover most of Kent.